The board-approved warrant was left unamended in tonight's relatively interesting deliberative session (video). Around 100 voters showed up, slightly less than in recent years. Board members took turns presenting an award and the individual warrant articles. The community gets to vote on the warrant articles on Election Day, March 10th. As expected, the $2M artificial turf field renovation for the high school provoked the most controversy. 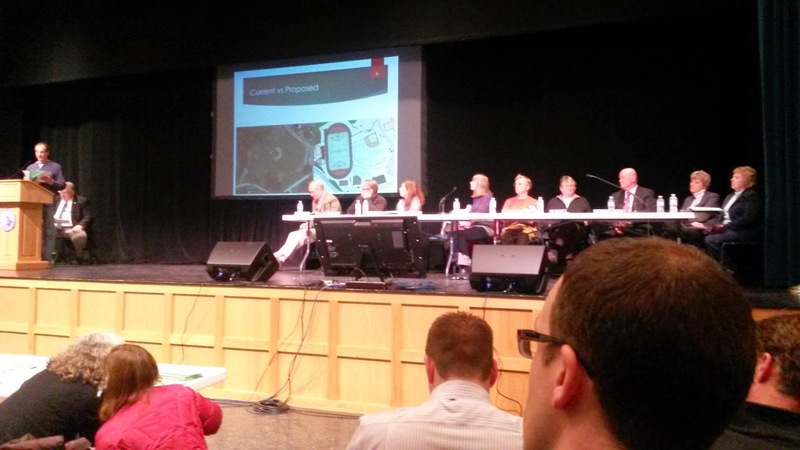 The proponents of the artificial turf were well prepared, with board member Kenny Rotner presenting the article. Kenny donned his medical doctor hat, reviewing the research and preemptively enumerating and dismissing health concerns. Dr. Bob Barth made a public comment worrying that "carbon black nanoparticles" that constituted over 30% of tire crumbs might have effects similar to asbestos. UNH Professor Dr. Glen Miller, known to readers of this blog as a primary football proponent, also happens to have spent 10 years doing research into carbon nanotechnology. He was able to definitively tell Dr. Barth that there's nothing nano about carbon black, and that your lungs would actually be quite good at expelling carbon nanotubes if you inhaled any, which you won't because they're expensive and never used as rubber filler in tires. Undeterred, Ann Wright proposed the only amendment of the night. She proposed reducing the field appropriation and bond by $550,000 with the intent that a grass turf field replace the artificial turf field. It looked bleak when it took a while to find a second for the amendment motion. UNH Professor Dr. Kevin Gardner, expert in sustainability science and environmental contamination, spoke next. Dr. Gardner reported on a Life Cycle Analysis comparing artificial turf and grass fields, taking into account all the steps including manufacturing, transportation, maintenance and disposal. He said that artificial and natural fields of the same size have about the same environmental impact (and no human health impact). Given that an artificial turf field can be played on non-stop, the fair comparison is to three or four natural fields, so environmentally the artificial turf is superior. If it'd been me, I'd be reeling under this onslaught of expert opinion. But Ann held up like a champ. John Parsons mercifully called the question, ending discussion. The amendment then failed nearly unanimously. One gripe with artificial turf that wasn't really disputed by the proponents is that it tends to get really hot on hot days, and heat-related illnesses are a reality. I find the Deliberative Session has brightened my feelings about the prospects of the field warrant article, which needs a 60% supermajority to pass. It certainly seemed to have a lot of support in the auditorium tonight. Principal Allen says there's a committee planning a VOTE YES ON 3 campaign. The rest of the deliberative session went smoothly. I said I was going to vote NO on the benefits stabilization fund in March, but didn't try to amend it. New school board candidate (and likely member-to-be given that he's running unopposed) Dan Klein introduced himself and invited any questions to be sent to DanKleinOR@gmail.com. Coming up on the calendar is Candidates Night Tuesday February 17 and Election Day Tuesday March 10, not to mention board meetings 2/11 and 3/4. See you at all of these.